The success of a technology solution largely depends on the methodology that is used to develop and deliver it. A methodical approach to software development results in fewer defects and, therefore, ultimately provides shorter delivery times and better value. We use a combination of agile and waterfall methodology in the product development lifecycle, agile methodology for development and waterfall methodology for the overarching project. Exelanz consultants work with the client to understand and define the business problems that client is trying to solve. We believe that a problem well defined is half the solution. We come up with possible solution options, suggest to the client and finalize on the solution that best addresses the business problems and offers highest value. Our marketing and product management professionals validate the solution using market information such as competition, industry trends and target customers to solidly define and strengthen the proposed solution. This is an optional step that Exelanz engages with if client decides to use our Marketing and Product Management Services. Our development team starts on the development of the solution. See our development methodology below to learn more about this step. We maintain the solution, and also handle operations if client requires. Managing complex software development projects involves efficient utilization of resources, prioritization of changes and features, accurate estimation of timelines, and risk management. 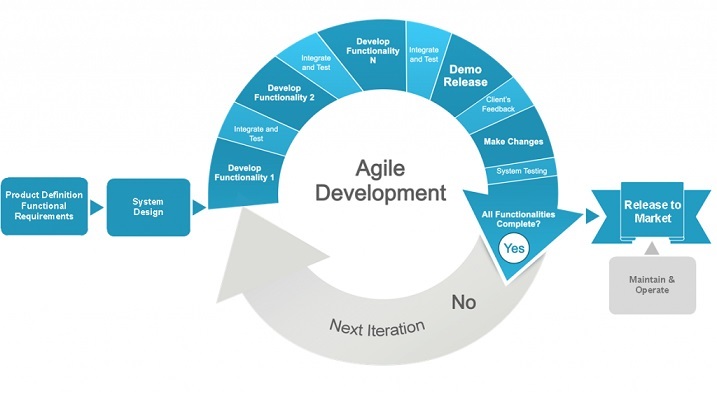 Exelanz’s agile development methodology is specifically designed to mitigate risk and increase value for our clients. Using an agile methodology, different facets of the solution are integrated to ensure that the business objectives drive the entire process, and the requirements and design are continuously refined as the code evolves. The methodology arranges the development into small releases, and mandates continuing integration of all developed components, incremental builds, and periodic validation of refined requirements and design. It also enables continuing refinement and integration to avoid any surprises in the later part of the lifecycle. Using agile methodology in every step leads to cost-savings and increased value. Using waterfall methodology for the overarching project leads to having control over the results. Quick feedback loop between the client and development team. Client-centric approach – focus on minimizing Total Cost of Ownership (TCO) and maximizing Return on Investment (ROI).